Ted Peck's favorite smallie flies in mouth of his graphite mount 24 1/2 incher. This has been the summer of the bug. On a good night you can swat enough mosquitos to make a meat loaf. Then there are the gnats that treat DEET like chocolate syrup, doing touch-and-go landings in your eyes and nostrils. Squadrons of big dragonflies dart across the water like tiny Apache gunships. These are good bugs. They eat mosquitos. Recent mayfly hatches are the biggest I've seen in years. Branches hang heavy with these short-lived beasts. Their exoskeletons join in thick carpets to float downstream once they give up the ghost-a scrumptious buffet for all swimming critters. Fishing can be tough when the water is splattered with so much hook-free food. Sometimes nothing in the tackle box will provoke a strike. Should you find yourself in this situation, you're just looking in the wrong tackle box. Fish are opportunists, feeding on the most readily available food. Should lunch du jour be bugs, show them something which looks like a bug. If you're like many anglers, your flybox gathers dust once the bluegill spawn is over after Memorial Day. There are always two flyrods in my Lund in the summertime. Until late July they are buried under other gear which gets used on a daily basis. The flybox is in the boat too. Somewhere. It took a good 20 minutes to find my flies one morning last month when the sky was raining mayflies and smallmouth bass found the boat overhead an inconvenience as they slurped in every bug they could find dimpling the water's surface. Ten minutes later my 8-weight St. Croix was threaded with a deer hair bug on the business end, with a pack of hungry smallmouth yearning for an education on hooks. My flyfishing technique can be described as an ADHD afflicted bandleader plagued by 200 chigger bites. In short, it ain't pretty. Fortunately, when fish are feeding heavily on a fresh insect hatch they are too overcome with gluttony to notice. Although serious fly-fishers strive to "match the hatch" there is little need for meticulous fly selection when bass are on a bender. A deer hair bug and Clouser Deep Minnow-or something like that-- are really all you need to get hooked up. The Clouser is available in a number of patterns. My favorite is the baby smallmouth bass. Cannibalistic bass have no couth. There are two caveats in finding fish-on-every-cast action with smallmouth on the fly: you must fish where the fish are and fish when they are feeding. On a summer river the best place to find smallmouth bass is near a shady riffle in close proximity to deeper water. The best times to fish are dawn and dusk when insect hatches are occurring. The best action will probably be on the east side of the river in the morning and west side in the afternoon on a river which runs generally north-south like the mighty Mississippi. On rivers which run east-west like the Wisconsin you might find success fishing near mid-river at midday-but a spinner or crankbait might be a better offering. Smallmouth bass have no eyelids. Their eyes are sensitive to light. Fishing summer shade, where available, is a good plan. Why can mid-day at mid-river be productive where the water runs east-west? Minimal glare caused by the angle of the sun.Fish will likely hold just one foot deeper than light can penetrate if they can find cover and a loafing area like an eddy below a big rock. Poking your rod tip in the water and noting the point at where it disappears from view provides a workable indicator of what this "magic depth" will be. If the rod tip meets resistance, quit pushing. Trust me on this point. Those who share my boat are subjected to a serious seminar on river fishing. I offer little advice to fly fishers. If they know how and when to mend a line they are already out of my league. One tip all new clients get is a word picture of planes and airports. You seldom see a plane coming in backward for a landing. Hydrodynamics and aerodynamics are similar in one respect: fish almost never rest with their tails towards the current. Looking for the best spot to put all this esoteric information to the test? You might try the Wisconsin River, targeting the first mile below the Dells dam-or jump in my boat at dawn or near dusk when insects come down like so much rain on the sleepy Mississippi. The smallmouths aren't holding everywhere. But when you find one there will likely be a sizeable gang of his brothers nearby, hankering for a fight. Cap'n Ted Peck has over 30 yrs. guiding experience, specializing in multi-species fishing on Pool 9-10 of the Mississippi from Genoa, Wi. to Prairie du Chien. 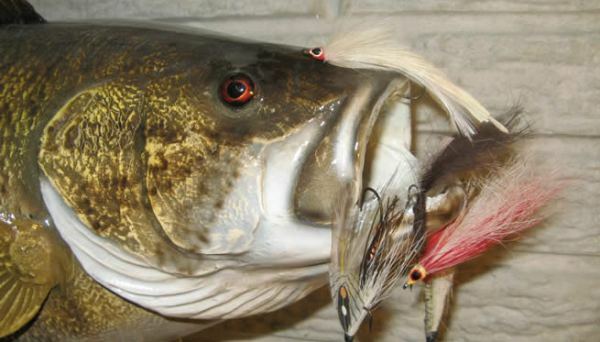 Cap'n Ted is a pro staffer for Lund, Northland Tackle, MinnKota, Bill Lewis Lures and Cottonmouth Lures. When not guiding Cap'n Ted communicates the outdoors experience via newspapers, magazines, TV, radio and through seminars. This work has taken him all over the midwest, Canada and beyond... but he always returns to the upper Mississippi which he considers the most diverse fishery in North America. Click here for more info on Ted's guide service. Cap'n Ted's new book Mississippi Musings with the Old Guide is a personal account of his long career as a professional fishing guide on Old Man River. It is available in the Lake-Link Outlet.